how can I create a Define in Infoassist with WITH Option?? Can't find it, but it has to werk, because after Manipulation it with Texteditor, it's still running with Infoassist. I don't see the WITH option for DEFINE. 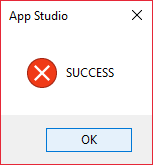 However, editing the code doesn't always lead to not being able to open it with InfoAssist. I'm not sure why they don't have that option in InfoAssist as I do see it available with App Studio. If it doesn't prevent you from opening it in the GUI again then Babak's suggestion is the only way. You can open a new feature request for that as well. No pages were found containing "with". When you create a DEFINE or COMPUTE that doesn't reference any real fields you associate it with a field using WITH. I finally found it using a Google search. Funny how Google can find it sifting through the entire internet, but IBI search can't even find it in their own docs. I think Magnify Search stands for just that. Magnifies the time it takes to find something useful. Whatever dev thought that name up #nailedIt! Search for Using Virtual Fields. Oh, we found it. It's just that someone that's inexperienced, and doesn't know the keyword WITH is used in context with virtual field creation, shouldn't have to know to search for "Using Virtual Fields" to find what they need. They should be able to type "WITH" and get to where they need to. Exactly. 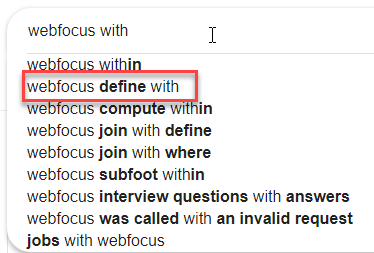 Where in Google you can type 'WebFOCUS with' and get 9 different search suggestions before you even search. Granted, they weren't perfect. It was after all the second search suggestion. ok, so back to my question..
You also can't create a with field with Infoassist ? No invisible button to click or something? InfoAssist has no WITH for DEFINE or COMPUTE. In the below example CNTR1 and CNTR2 has the same expression but behaves very different. Addy, nice! *standing ovation/applause* Thank you. Now THAT is an explanation I can wrap my head around. Thank you Addy.